Sikkim Manipal University is one of the most prestigious university in India for distance education courses. You may be already familiar with SMU MBA, MCA, BBA & BCA courses but there are many other courses that SMU offer to students. The university was formed in 1995 in a Public-Private Partnership between the Government of Sikkim and the Manipal Group. Currently the university is enjoying 700+ Authorised Centres with over 4 lakh students in 205 districts and 300+ towns and cities across the country. In this article we'll talk about the complete list of courses offered by Sikkim Manipal University. Currently Sikkim Manipal University offers various distance learning courses in following discipline. Below is the list of undergraduate courses offered by Sikkim Manipal University through distance education. It is a 3 years course offered under the category of Arts & Humanities and Vocational Sciences courses. The course can be completed in minimum 3 years (6 semesters) and maximum 6 years. This program exposes students to recent developments in media issues and media research. Students with 10+2 or equivalent / 3 year Diploma from a state board of technical education are eligible for this program. Semester Fee for this programme is Rs.12,450/-, Although students can also pay the full fee of INR 74,700 in one go. It is a 3 years course offered under the category of Management Courses. The course can be completed in minimum 3 years and maximum 6 years. Students with 10 + 2 or Equivalent / 3 Year Diploma from a State Board of Technical Education are eligible for this program. The semester fee of this program is Rs. 12,950/- although students can also pay full fee of amount INR 77,700 in one go. It is again a 3 years course offered under the category of Information Technology. Students with 10 + 3 year diploma in IT/CS from a State Board of Technical Education are eligible for admission into this course. Students can also take admission though Lateral Entry system. For Lateral Entry students have to a Direct Entry Fee of INR 5,325. For Lateral Entry students the minimum duration to complete the course is 2 years and maximum is 4 years. Semester fee for this program is INR 12,950. Students can also pay the full fee of amount INR 77,700 in one go. This is a 3 years duration programme offered under Healthcare category. The minimum duration to complete the course is 3 years (6 semesters) and maximum 6 years. Students with 10+2 or equivalent with Biology & Chemistry OR 10+2 or equivalent in Science (without Biology) are eligible for admission into this course. Semester fee for this programme is Rs. 16,950/- and practical fee is Rs. 6,500/- per year. Below is the list of post graduate courses offered by Sikkim Manipal University through distance education. MBA is the most popular course offered by Sikkim Manipal University. We've already wrote about SMU Distance Education MBA in our previous article. SMU Distance Education MBA also ranked among top 5 distance education MBA courses in India. It is a 2 years (4 semester) programme and can be completed in maximum 4 years. Students needs to clear SMUDE Management Aptitude Test (SMAT) to get an admission into the programme. Although if you've scored minimum 45 percentile in National / International MBA Entrance Test, you're exempted to take SNAP. The semester fee for SMU-DE MBA is Rs. 15,000/-. MCA is 2nd most popular post graduate distance education course offered by Sikkim Manipal University. It is a 3 years course and can be completed in maximum 6 years. A 3 year graduation from a recognised university is required to get admission into this programme. Lateral Entry to 3rd semester is also available for students who have completed BE (CS/IT) / BTech (CS/IT) OR has done 3 year graduation from a recognised university with 1 Year PG Diploma in IT / CA from a recognised university/DOEACC ‘A’ level thereafter. The first two semester fee for this course is Rs. 14,200/- and 15,200/- from 3rd semester onwards. MSc IT is another popular course offered by Sikkim Manipal University. It is a 2 years duration course and can be completed in maximum 4 years.Students should have done a 3 year graduation from a recognised university to be eligible for admission.Students can also take a direct admission into 3rd semester through lateral entry system. Students with BE (CS/IT) / BTech (CS/IT) degree OR 3 year graduation from a recognised university with 1 Year PG Diploma in IT / CA from a recognised university/DOEACC ‘A’ level thereafter are eligible for lateral entry. The semester fee for this course is Rs. 13,200. 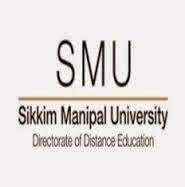 Above is the complete list of distance education courses offered by Sikkim Manipal University. We've tried to provide you as much information as possible. If you wants to know more about any of the courses mentioned above feel free to drop us a line using our contact us page. Alternatively you can visit here to know more about the courses offered by SMU.